Philanthropy makes the exceptional student experience possible. The Annual Fund, or “ALL IN” campaign, provides critical resources for Charles Wright – a steady stream that keeps the school moving. Your philanthropic supports makes up most the difference between the actual cost of educating each child and what is covered by tuition. Annual Fund gifts supplement funding for technology and instructional materials; provide faculty with the best resources available; bolster financial assistance for qualified students; and ensures that Tarriers can explore the visual and performing arts, athletics, world languages, music, the great outdoors, scientific research, and experiential education. Thank you to the following current CWA families for their support of the 2018-19 Annual Fund. The Annual Fund is our school’s number one fund-raising priority every year and Annual Fund donations directly impacts faculty and students and teaching and learning. Your gift helps cover the costs of the school’s educational programs, as well as faculty salaries, computer technology, financial aid, athletic equipment, cultural opportunities, music and art supplies, outdoor education gear and more. Every year, all members of our community (parents, faculty, staff, trustees, alumni, parents of alumni, grandparents, and friends) are asked to make a tax-deductible gift to CWA. Money raised through the Annual Fund ensures our school has all the necessary resources to provide each child with a challenging and rewarding educational experience. Tuition covers only part of the actual cost of educating each Charles Wright Academy student. Virtually all independent schools raise revenue through an annual fund to help cover operating expenses. Why is my participation needed? The impact of your participation is valued beyond the dollars. Your participation demonstrates your commitment to CWA and its continued success. It is a vote of confidence in our school, our faculty, and our educational mission. 100 percent participation is evidence that everyone in our community shares in the effort. Foundations, grant-making institutions, and major donors all look at fund-raising participation as a key indicator of satisfaction. If the community stands behind the school, those organizations deem CWA more deserving of their support as well. Does it matter when I make my gift? Yes. A gift or pledge made early in the school year is a great advantage to the school because it enables us to know how much money will be available to support the school’s budget. 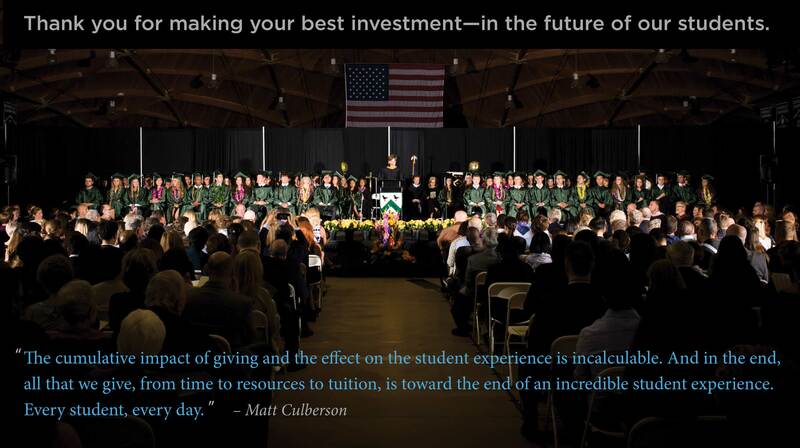 The goal is to have all Annual Fund commitments in by December 31. Pledges must be paid by June 30. We ask that you contribute at a level that is personally meaningful to you. Every gift of any size is needed and important. What does the bulk of Annual Fund money go toward? The Annual Fund, like our operating budget, primarily supports our faculty and our programs. 57 percent of CWA’s operating budget goes to salary and benefits. The Annual Fund supports all of the operations of the school, including the financial aid program. CWA has awarded aid in the amount of $3.2 million in 2017–2018. Approximately 27 percent of students are receiving financial aid this year. CWA asks for money in several ways. How do we prioritize? The school relies on the Annual Fund to support the operating budget each and every year. We ask that all families participate in the Annual Fund and hope that each family will make CWA their top philanthropic priority. We hear other schools talk about a tuition gap. What is CWA's gap? The “gap” is the difference between tuition dollars received by the school and the actual costs of a CWA education. That amount is approximately $1,800 per student. The “gap” is funded, in part, by the Annual Fund. What is the impact of giving? – Nate Mondou ’13; professional athlete; Stockton, Cal. – Laura Malcolm ’00; entrepreneur; Tacoma, Wash.
Why do CWA faculty and staff give to CWA?